Could blackcurrants be 'superfuel' for your brain? SCIENTISTS in New Zealand have found that New Zealand blackcurrants help people stay more alert, work with greater accuracy and reduces mental fatigue whilst under significant mental stress. In a double-blind, randomized clinical trial on 35 young adults, subjects underwent intense mental challenges for over an hour in tests that were intended to be long, stressful and mentally fatiguing. 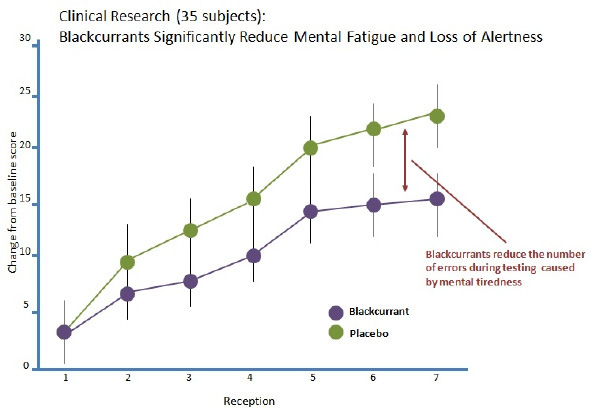 Subjects supplemented with the blackcurrant extract used in CurraNZ worked more accurately without slowing down, and after the test, reported they felt more alert and less mentally fatigued. The study leader, Dr Arjan Scheepens, says: “We know that there are compounds in dark berry fruits, like blackcurrants, that have real effects on people’s health and wellbeing. “We found that, compared to a placebo, taking an enriched blackcurrant extract before performing stressful mental tests helped trial participants maintain accuracy, and that their mental fatigue was significantly reduced." Whether you have an intense day planned at work, competing in a sporting event or knuckling down to exams, take CurraNZ beforehand to help kick-start your mental performance for the day ahead!